FAA is banning drones at the Super Bowl. Of course, no such force was used on the drone that a drunk National Geospatial-Intelligence Agency employee flew onto the grounds of the White House. But the Super Bowl is pretty important, so who knows what could happen there. The flight restrictions over major sporting events were imposed by Congress in legislation passed after the 9/11 attacks. The FAA’s Superbowl [Temporary Flight Restriction] implements that mandate. There are also federal rules passed after 9/11 that prohibit unmanned aircraft and model aircraft in Washington, DC. The FAA may not be able to spot every little quadcopter near the White House, but bringing one to the Super Bowl could “spoil the game.” So leave your drone at home, brah. 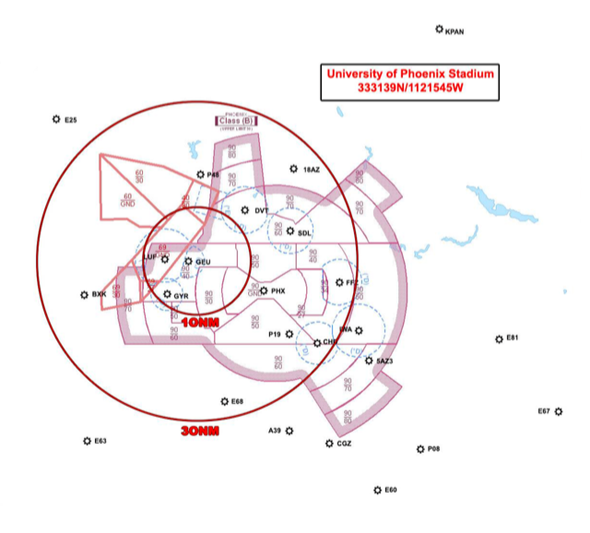 A map of the inner (10-nautical-mile-radius) and outer (30-nautical-mile-radius) no-fly zone.